The prospect of returning to work after your baby is born can be a very frightening and overwhelming prospect for some Mothers, but with a little extra planning and knowledge about how to do this, you can smooth out this transition quite a bit. In case you didn’t already know, there are several benefits to combining work and breastfeeding. Knowing this might help give you a little bit of extra strength to leap over some of the more common hurdles that women face when re-entering the workforce AND taking care of a baby! It’s not easy, but you got this! Benefits to Baby: Making the decision to supply breastmilk to your baby while you are working provides protection from ear infections, respiratory infections, allergies, colds, viruses and diabetes to name a few. Benefits to Mother: Reduced risk of breast, uterine and ovarian cancer; decreases the risk of osteoporosis and allows for precious time to reconnect with baby. Benefits to Your Wallet: One-day absences to care for an ill child occur more than twice as frequently for women who formula feed their infants as compared to those who breastfeed. And if you haven’t checked out the cost of formula…it isn’t cheap! Speaking with your supervisor about your plans for pumping at work BEFORE maternity leave is a great idea. If not before, than as soon as possible. Locate the lactation room in your workplace; does it have a fridge to store your pumped milk or will you have to bring a small cooler? Order you pump BEFORE your baby is born and understand how it works. While you are at it, gather your other pumping supplies ahead of time; collection bottles, storage bags and cleaning supplies. Plan your day: how will pumping fit into your workday? Consider making a mock-up of what your day will look like, from the moment you get up to when you step back through your doors. When and where will you pump? For most moms, pumping every 3 hours or so when separated from baby, for much of the first year, will help to keep your milk supply up and running. Week 1-4: Avoid pumping. Take this time to be with your baby! Allow the infant to naturally ‘program’ and establish your milk supply. Week 4-6: Begin pumping once a day for 10-15 minutes and introduce a bottle. Adding this pumping session in during the morning or evening can be the best for when your milk supply is at its peak. Weeks 6 and Beyond: Pump daily to store your milk or to have ready for your workday. Milk Storage Strategies…The best tip I ever received! The freshest is the bestest! Ok, bestest is not really a word, but I bet you get the picture: Always try to give your baby the freshest milk you have on hand, it will be highest in nutritive quality and deliver the most health benefits. Think “first in, first out”. However, it’s also a good idea to rotate your frozen stash a bit too. Here is a way to do that: On Sunday night, take a days’ worth of frozen milk out of the freezer to thaw overnight in the fridge to feed baby on Monday. The milk you pump for Monday while at work will feed baby on Tuesday; Tuesdays’ pumped milk feeds baby on Wednesday, etc. No need to freeze this milk in-between, just keep it cool in the fridge. Remember: Take a deep breath, take care of yourself too, and ask others for help. Leave us a comment about how you returned to work while breastfeeding and pumping. Motherhood is a gift. It is also one of the most important full-time jobs you’ll ever have. You’re responsible for loving, protecting, shaping, and nurturing this adorable little human who was next in line to join this world we live in. It’s a big deal. It’s a 24/7 job actually. There are no paid breaks for every four hours worked. No paid time off, vacation time, and no paid sick time. You’re paid in sweet little coos, smiles, and giggles which turn into sweet phrases and affectionate little hugs to mommy. As they grow, you feel a moving satisfaction watching them thrive at their own pace. It’s amazing. It’s one of those gifts in life I’ll never understand how I was fortunate enough to experience. However, for me, it is a job you learn on the fly. I wasn’t warned that motherhood would leave me sleep deprived to the point of tears. Given, I decided to breastfeed without supplementing, that eliminated even more sleep from my regimen. But when one great lactation nurse introduced me to pumping, it totally enhanced my life. Pumping my breast milk allowed me to receive help from my spouse with nightly feedings. Although I was never the mom with an overflow or a freezer supply, pumping even made it possible to occasionally have an outing for myself and the occasional date night with my husband. With the twelve weeks of my maternity leave, cabin fever may eventually set in for moms like myself. You need an outlet—some quality time alone, aka ME TIME. Pumping milk allows you to do this. Also, when that maternity leave ends for us working moms, that milk gives both you and baby that warm, fuzzy feeling while you’re apart. Well, maybe not warm, fuzzy right away for mom, but it definitely gives you the security that your baby has what they need while you’re apart. I’ve literally tried several different pumps and landed on the Spectra S2Plus. Occasionally, I was discouraged by the amount of time I spent pumping and my output. Although my supply wasn’t in abundance, I typically had what my baby needed. It just took an eternity to get it out with the other pumps. 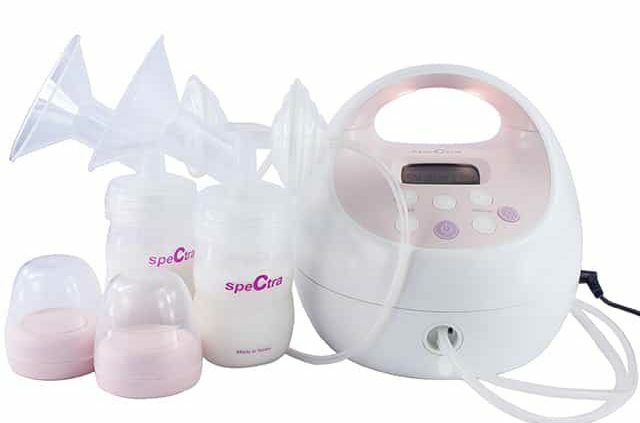 Spectra was my fifth pump and it helped lessen the time tremendously with an even better output. I often got more ounces out with it. Another plus was that it didn’t leave me feeling like someone had attached a blaring vacuum cleaner to my chest lol. My Spectra was so quiet that I was able to pump in the office quietly without distracting anyone walking past the office like my others. A great pump can change the trajectory of your breastfeeding journey. It’s extremely easy to want to quit if you’re pumping and experiencing difficulty with supply or time allotted at work for pumping. A friendly and efficient pump can enhance the journey so much that you’ll look up like me and realize it’s already been fourteen months! I have no plans of stopping for at least the next ten months. Both of my children are pretty healthy and I honestly believe the use of my Spectra pump is a part of that success. Makes me wish I’d had my Spectra the first time around almost eight years ago! If you’re thinking about what pump to get, trust the other thousands of us who have tried many others and stick with Spectra. Check here to see if your insurance covers it. New moms, we know travel can be tough. Not only do you have to spend time away from your little one, but you also have to worry about how, when, and where to pump in a place that’s new to you. Luckily, we’ve thought this one through for you! Check out our top five tips on storing, pumping, and transporting that liquid gold while you’re away from home. Before you leave town, stock up an extra supply of milk to cover as many days of your trip as possible. Pumping after each nursing session is a great way to store away a few ounces at a time. You may be able to squeeze in an extra pumping session or two each day as your baby develops their feeding schedule. When you’re traveling, the Spectra S1 Double Electric Breast Pump is the way to go. It’s easily portable and charges like an iPhone, so you don’t have to worry about batteries. When you need to squeeze in a quick pump on the go (aka: airplane bathrooms), the Spectra S1 will be your new best friend. Along with your pump, be sure to pack backup parts like extra storage bags, valves, and tubing as an added precaution. With Ashland Women’s Health, you can get the Spectra pump and accessories delivered right to your door, free of charge. Simply fill out this form with your insurance information to make sure you’re eligible. Interested in the portable version? For just a small upgrade charge, Ashland’s got you covered. For even the most confident mother, pumping outside of the comfort of your home can be intimidating. Add traveling in the mix and finding a place to pump privately is even harder to come by. Thankfully, the Mamava app is here to help, providing breastfeeding accommodations near you, along with instructions on how to access them. Mamava even has lactation pods that are starting to pop up everywhere, offering a private, compassionate space to pump. If it’s your first time pumping away from your little one, speak with an experienced IBCLC. You can find one using Spectra Baby USA’s list of certified IBCLCs. If you live in the Chicagoland area, The Lactation Network from Ashland Women’s Health is also an invaluable resource. The Lactation Network’s IBLCLCs use their expertise to walk you through the pumping process—and, hey, they’re available and free* through your insurance! When you’re pumping during your trip, it’s important to make sure you have a plan in place to get that liquid gold home. Milk Stork is a great company that provides prepaid refrigerated boxes so you can easily ship breast milk via overnight delivery. Simply select the size of box you need, and Milk Stork will deliver directly to wherever you’re staying. All you’ll have to do is pack up the box and drop it off at FedEx. Still need some extra room? Try using a Yeti cooler as a backup. These coolers are airplane-friendly and a great reusable option for future trips. As moms ourselves, we know how hard it is to be away from home. To unwind from the chaos of travel, carve out some time for self-care. Whether you prefer turning on some bad TV or cuddling up with a good book, charging your battery is a key ingredient to making it all work. Feeling guilty is normal, especially if it’s your first time away from your little one. But making the most of those few days away—did someone say a full, uninterrupted night of sleep?—will make those sweet baby snuggles even more worth the while when you get home. *Exclusions may apply. Limited to specific insurance providers.